When was the last time you experienced a moment in videogames that really hit you like a shot to the gut? And I’m not talking about something emotionally devastating (such as a main character you have grown to love dying), I mean something physical. A moment so visceral that every one of your senses is affected. Sure, videogames can be endlessly engrossing, but only a handful step up to that next level and make the player feel like they are performing every action with the character on screen. It’s something that is hard to describe, but once experienced is impossible to forget. 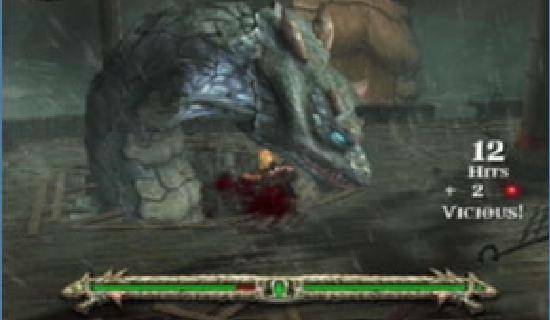 One such moment occurs fairly early on in the PlayStation 2 masterpiece God of War. If you love this game like I do you must already know what I am talking about. The game possesses some of the most gloriously over-the-top videogame sequences of all time, exemplified by its very first boss battle. You might want to eat a rare steak or buy some power tools before continuing. Videogame moments don’t get any manlier than this (sorry, Bill and Lance). In God of War you play as Kratos, a very tough and extremely ruthless Spartan warrior. Even with God of War being a somewhat recent game (at least by Memory Card standards), Kratos has already become an iconic figure and one of the most recognizable faces in videogames. And deservedly so. The God of War games are, for lack of a better term, amazing. At the very start of God of War, the player is treated to a gorgeous cutscene showing Kratos standing on top of a giant cliff in Greece. For no apparent reason, Kratos then hurls himself off the peak in an effort to kill himself. It is at this moment when the game flashes back to focus on the events leading up to Kratos’s tragic decision. You see, Kratos is an extremely troubled soul. As a Spartan warrior, he killed hundreds of men and eventually amassed an army of thousands to aid him. 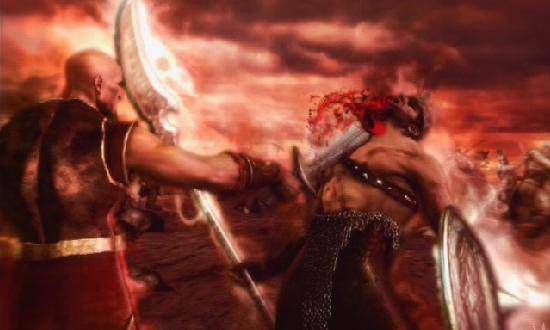 During an epic battle, Kratos’s entire army is slain and he has no other choice than to call upon the Gods to save him. With this plea, Ares, the God of War, grants Kratos his wish and offers him salvation. In exchange for his service, though, Kratos is forced to be Ares’s puppet. Armed with the Blades of Chaos, whose blades are attached to his arms by chains, Kratos spends ten years serving Ares and performing his horrible and violent deeds. During a routine raid -- despite the warnings from a wise Oracle -- Kratos enters a village and begins killing everyone, following the bidding of his master Ares. Sadly, Kratos discovers that his two final victims are none other than his own wife and daughter, purposely targeted by Ares to ensure that Kratos becomes his ultimate warrior, free of all family ties. Enraged and saddened, Kratos goes into exile, refusing to help Ares any longer. 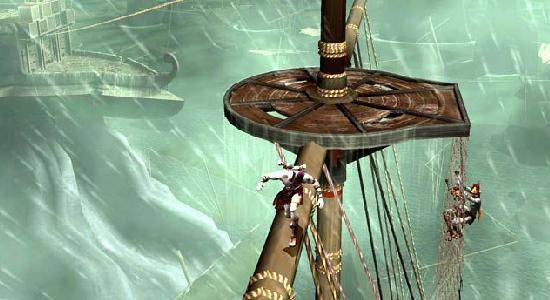 As the playable game begins, Kratos is on a ship that is wandering aimlessly around the Aegean Sea. After being attacked by demons, the God Poseidon asks Kratos to dispose of the Hydra, a huge aquatic beast that is terrorizing the seas. Kratos agrees (as he has no other goal in his miserable life) and begins a journey through the first level of the game to find and destroy the Hydra. After a challenging sequence of demon fighting and basic platforming, Kratos eventually reaches the fearsome Hydra on the deck of a random ship. This is when the next Memory Card moment occurs: the battle with the Hydra. Facing the Hydra is nothing short of epic. When you, playing as Kratos, first board the chaotic ship, the Hydra appears sporting three giant heads. The largest of the three heads (and the key to defeating the massive monster) looms high above Kratos, next to the tall mast of the ship, while the other two, “smaller” heads lay low to the ship’s deck. The player’s first thought is to immediately climb the convenient netting hanging from the mast to reach the primary head of the Hydra. Unfortunately, once Kratos starts to climb the net, the two secondary heads knock him off, halting his ascent. Speed and timing don’t even matter as the heads will always manage to knock Kratos down. At this point the player must obviously figure out a way to defeat the two smaller heads in order to be able to reach the ship’s mast. After hacking away at one of the heads for a while (dodging its attacks in the process), the head will finally collapse on the deck, exhausted and beaten up by Kratos’s Blades of Chaos. If the head is left alone for too long, though, it will revive itself and the process will start all over again. On top of that, the other head cannot be defeated while the first lay unconscious. There just isn’t enough time. This is when the player has to use more than just brawn to proceed onward. Above each head is a hanging platform with a huge metal spike protruding from the bottom. After knocking out a head as mentioned before, Kratos has to quickly jump on a stack of crates to reach the elevated platform. 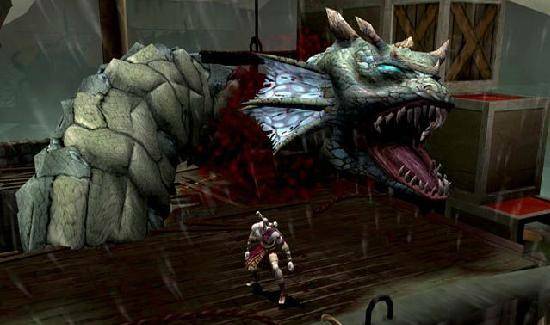 Once Kratos leaps on the hanging platform, it comes crashing down, impaling the underside spike through the Hydra’s head and pinning it to the deck. After completing this violent and admittedly satisfying task on both smaller heads, the path to the mast is free to be traveled. It is also worth mentioning that the heads actually writhe in pain once defeated while constantly trying to break free from the spike’s hold. It is a gruesome detail, but really adds to the overall chaos of the battle. No disappearing sprites in this game! 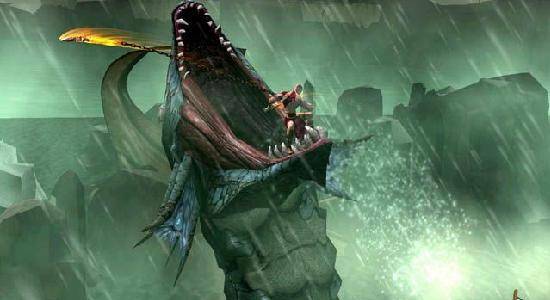 Once done climbing to the top of the net, Kratos comes face to face with the main Hydra, the final obstacle between him and victory. This is when the game introduces a mechanic that God of War has become pretty famous for. Once the Hydra’s energy is depleted to a certain point, a large icon displaying one of the buttons on the PlayStation 2 controller pops on the screen. The player has to quickly hit the button before time runs out, resulting in something more akin to a rhythm game than the traditional action-oriented boss fight. Press the button fast enough and Kratos attaches his Blades of Chaos to the side of the Hydra and pulls, slamming the creature’s head into the side of the ship’s mast. This process is repeated a few times until finally the mast breaks off at the top, forming itself into a huge, pointy wooden spike. After hacking away at the Hydra a little longer, the final button pressing sequence presents itself. 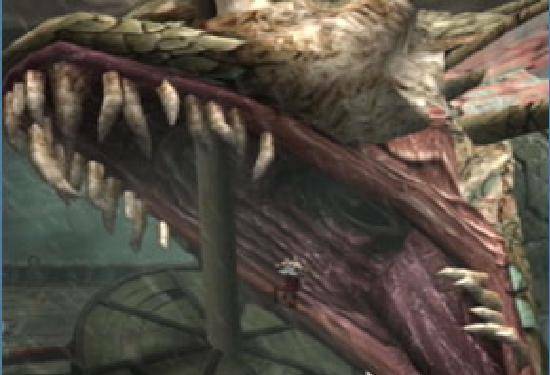 This time, however, Kratos actually launches himself on top of the Hydra and plunges his sharp Blades of Chaos into the monster’s eyes. 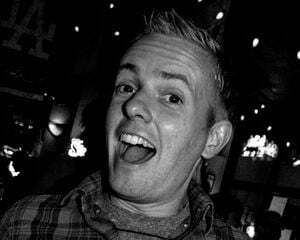 Blind and confused, the creature lets off a horrific scream. Using this golden opportunity to his advantage, Kratos attaches his blades to either side of the Hydra’s mouth. 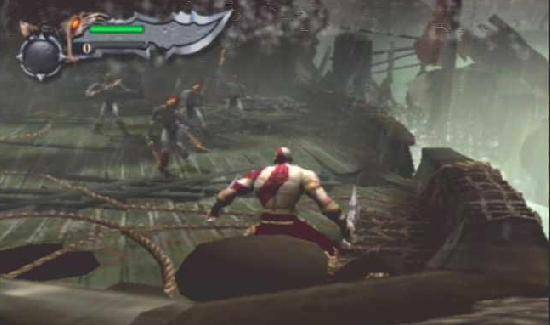 After pressing the button on the controller as fast as possible, Kratos jumps off the back of the ship’s mast, using the weight of his body to pull the Hydra’s head downward. As the Hydra lunges forward, the broken mast pierces through its head. With this final act, the Hydra finally dies, ending one of the most amazing boss battles in the history of videogames. Whew! I will never forget the first time I battled the Hydra in God of War. 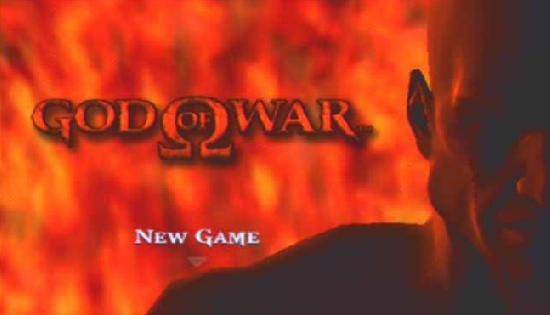 To be honest, I wasn’t that excited about playing God of War the first time I laid eyes on it. Sure, it looked great, but I was worried it was going to be a generic action game that relied on nothing but blood and guts to get attention. Once I played the game, however, it immediately skyrocketed to one of my favorite games of all time (and still remains on that coveted perch). Besides the obvious gore and over-the-top violence, God of War really is an impeccably designed game and the boss battle with the Hydra is the perfect example why. Let’s first state the obvious: all the aesthetics of what make a videogame great are in prime form here. The graphics, the camera angles, the sound effects, the music -- all of these things are exemplary and some of the best the medium has ever seen. But beyond the pretty shine, the battle with the Hydra is an amazing piece of design. The battle begins with a basic goal: defeat the Hydra. Okay, simple enough. But the fight presents itself with several challenges. First off, there are three heads instead of one. While it becomes fairly obvious the larger, higher head is the ultimate target, the two secondary ones, come to find out, must be dealt with as well. How many designers would make the player just hack away at the heads until they were defeated with no other means of destroying them? The answer, sadly, is a lot. In this battle, though, the player has to think outside the box by utilizing the environment to help destroy the beast. When is the actual structure (in this case, the ship) used as a weapon in a videogame? Almost never. I remember really struggling with how to beat the smaller Hydra heads the first time I encountered them. While it seems obvious in hindsight, part of the challenge was in the fact that there is no guidance in how to complete your goal. No nonsensical sign posts or pointless exposition instruct the player what to expect once they reach the boss. It is all about using visual clues to help figure out what to do. Even the final section of the battle, with the main Hydra head, utilizes little details that are pretty incredible. The way the mast slowly breaks apart until it becomes the very weapon you must use to kill the creature is brilliant! Again, the environment is used in an unexpected way. Basically, the ship -- which in most games would be merely a simple set piece -- becomes a vital part of the battle. Most significantly, the battle with the Hydra just feels different than most videogame sequences. As mentioned before, every slash, every hit that Kratos delivers sends a shockwave through the player’s body. Of course this has a lot to do with the perfect combination of sound effects and visual panache, but I really think there is more to it than that. Just go back and watch the above video again. Actually, better yet, go and play this sequence one more time. You can almost feel the metal spikes from the hanging platforms pierce through the smaller Hydra heads. 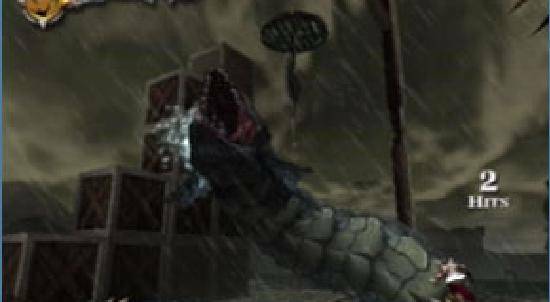 Watching Kratos leap onto the head of the Hydra as the camera sweeps all around him is almost indescribable. It really takes boss battles to a brand new level and, most importantly, makes them fun again. Remember when a boss battle was what you would look forward to during every game? God of War brings that nostalgic feeling back and multiplies it infinitely. 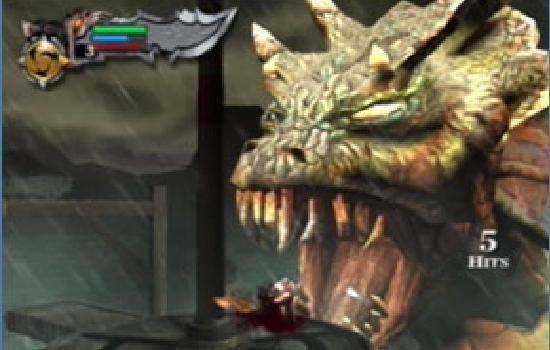 Honestly, all of the boss battles in the God of War series are instant classics and deserving of a Memory Card post, but the Hydra battle -- at least to me -- will always be the best.